The Captcha entry jobs are one of the most searched online jobs on the internet. Due to the increased popularity of captcha entry over time, people who look to make some money online started to do captcha solving work. Without knowing what is captcha typing job, many works on the captcha entry sites just to make pennies by wasting their precious time. I’m one of the experts in helping people to make money online and now I will explain to you what is captcha entry job and is it worth to use your precious time to do captcha typing work. Before getting into the captcha entry work, let us see the basics of captcha and its use. The captcha is a program that is used to eliminate bots or automated programs from accessing the application or website. In simple words, the captcha is a protection application which requires Human intelligence to solve. Only a human can solve the captcha and enter the application while the bots will be blocked from accessing the protected source. CAPTCHA – Completely Automated Public Turning Test To Tell Computers and Humans Apart. What are the uses of captcha? Captchas are mostly used in online websites to prevent bots from entering their websites. The bots can continuously request for information from the website and might use the hardware resources that slow down the web applications. Captcha plays an important role to stop those bots. The captchas are used in internet banking websites to stop brutal attacks made to steal sensitive information like passwords, PIN etc. Captchas are used in web applications like SEO tools, PTC sites, etc. to prevent automatic requests and hacks. Social media sites such as Facebook, Twitter uses captcha to eliminate hackers steal the sensitive information of Facebook. This is the most common type of captcha used on the web apps is the traditional Image to text captcha. It’s a known fact that the bots cannot read images unless there is an Alt text. So, Human intelligence is required to read the words written on the image. To solve this captcha, the user should enter the text given on the image in the text box provided below the image. Once the submit button is clicked, if the captcha is solved correctly the user will be provided access to watch the content. If the user solves the captcha wrong, the program will again ask the user to solve a different captcha. Until the user solves the captcha correctly, he will not be allowed to access the content. The Google Recaptcha is an advanced captcha a product of Google. This was replaced by the Google Recaptcha – 1 an image to text captcha and called Google Recaptcha – 2. To solve this captcha, the user must click in the box near I’m not a robot. Once clicked, Google will verify the request received from the user and allow the user to access the content. If the Recaptcha doubts the clicker is not a human, it will ask to verify by solving the question as given below. 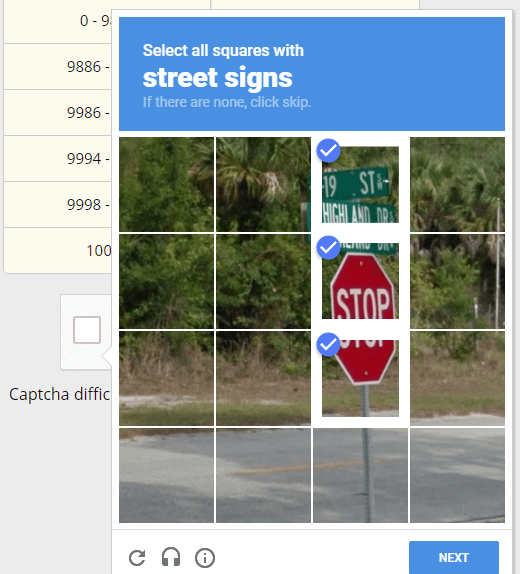 In this captcha, it asks the user to select all the street signs in the given image. Once the user selects the required blocks on the image, the access will be granted to view the content. To solve this captcha Human intelligence is required and no bots can select the blocks of the image by its own. Google Recaptcha-2 is the best robot shield. This is the easier and basic captcha where the user should select/click the icon among many icons. 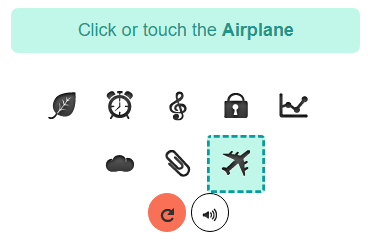 In this captcha, the user is asked to select the Aeroplane. Once the Aeroplace is selected, the access will be granted to the user to access the content. These are the few examples of captchas that are used to protect different systems from the automated bots. Now you know what is a captcha and how captcha works to protect the system. Let’s move on to the main topic about captcha solving job. What is Captcha entry jobs? Captcha entry job is provided by the captcha entry sites. These sites pay the worker for solving the captchas. When the users join the captcha entry site to do captcha entry job, they will be given instructions on how to do the captcha solving work. Once the users understand what is captcha entry, they can immediately start the work to earn money. When the member enters the worker board, it looks similar to the image given below. A timer will run at the top of the worker board with the image and text box below. The member must solve the captcha within 15 seconds to get paid. To solve the captcha, the member must read the image and type the letters given on the image in the text box given below. Once entered, the member must hit enter button or click submit button. The next captcha will load once the current captcha is solved. The member can continuously solve the captchas until he feels to leave. The more captcha the member solves, the more he can earn. Captcha entry sites pay very less money for solving the captchas which will be between $0.0004 to $0.0015 per captcha solve. So the users need speed and accuracy to earn at least a dollar per hour. The captcha rates are calculated based on the biding. The rate is bid per thousand captchas. The bidding is done based on the number of bidders bids for at the same time. 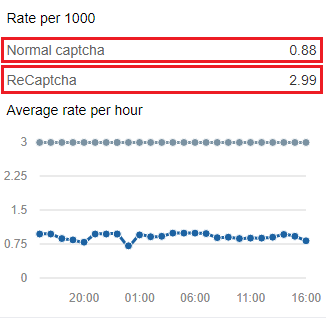 When there is more requirement, the captcha rate increases and when there is less requirement, the captcha solving rate will decline. In US daylight time the captcha rate will be $0.80 to $1.50 per thousand and night time the captcha rate will decline to $0.30 to $0.70. It’s better if the user works in the US daytime instead of night time. Currently, since the new smart captcha has been introduced which is hard to solve, the captcha entry sites pay up to $3 for solving 1000 captchas. Solving smart captchas are interesting and easier compared to the regular image to text captchas and it helps the members to earn more. Member solves 1000 captcha per hour in US daylight – $0.001 avg x 1000 = $1/hr. Member solves 1000 captcha per hour in US nighttime – $0.0005 avg x 1000 = $0.50/hr. In rarest case, the member solves captcha at 70 WPM max bid – $0.002 x 1500 = $3/hr. Solving 1000 Recaptchas(smart captcha) per hour – $0.003 x 1000 = $3/hr. The captcha entry sites are actually working for the third party companies to help them automate their services. These companies used to provide automation services & software to their clients. But, sometimes captchas will have to be solved when these automation services use third-party tools. So, these companies require human intelligence to solve the captchas and make their service fully automatic without their clients need to fill the captcha. Here comes, the captcha entry sites to help the companies to solve the captcha with the help of their members. The companies pay money to the captcha entry sites and those captcha entry sites organize the captcha entry services and pay money to the members for helping them by solving captchas for the companies. The companies will use the API in their software provided by the captcha entry sites to complete this process. Example of the companies which use the captcha entry services to automate their software/services/tools – Gaming bots, search engine optimization, social networks, script developers, cryptocurrencies, auto-submission software etc. Captcha entry sites provide job to the users worldwide to earn money online. The captcha entry jobs are available 24 x 7 to anyone who wishes to earn online. Captcha solving jobs is very simple and does not require any special qualification. Captcha entry sites pay through PayPal, Payza, Western Union, Bitcoin etc. 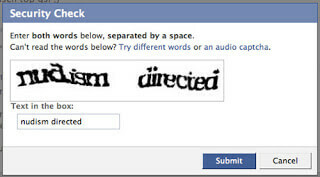 The captcha entry services are considered against the ethics. To work on captcha entry sites, the user must be connected to the internet with decent speed. Too many kick outs due to low internet speed, inaccuracy, and slow typing will result in the account ban. Captcha entry job is a waste of time if we compare time: money earned. There are few captcha entry site(s) scam people which promises to pay more money. Now you know what is captcha entry jobs and why do captcha entry sites pay us money for doing captcha typing work. Captcha entry services actually do little good and more bad to the bot protection. Captcha entry sites actually help the real companies which actually provides legitimate services. But, the captcha entry services might be used by hackers, scam companies to easily steal information, hack websites by using bots by easily skipping the bot protection(captchas). Are captcha solving jobs legit or scam? Actually, the captcha entry sites are legitimate, not scams and they really pay their members on time. But, it’s you who should decide if you wish to work for the companies which crack the bot protection with the help of you. If you’re looking for some legit captcha entry sites that are paying for years, its here for you – Captcha entry work. Thanks for the great article! You’ve beautifully explained A-Z about captcha entry jobs. The thing is I was wondering why and how captcha entry sites pay users. Now, I got a clear idea about it and made my decision!!! That’s great you loved this article!